The Penthouse is a luxury serviced apartment on the top two floors of a converted 19th century tea wharf in London’s stylish and trendy Shad Thames area close to Tower Bridge. It’s located next door to the Design Museum in an area of cobbled streets and converted wharves which have been used as a backdrop for countless films and adverts. And rarely a day passes without a film crew shooting some footage in one of the streets. This is a very safe part of London with its pedestrianised river walkway which runs for two miles along to Waterloo Bridge. And there are more than 20 restaurants and bars within just a few hundred yards. Tea Trade Wharf is located next to the Design Museum in London’s trendy and stylish Shad Thames area. The old wharf dating back to the middle of the 19th century is a protected building. It has been modernised and given a contemporary feel inside. The reception is manned 24 hours a day. The lower floor of the Penthouse features a large comfortable seating area with floor to ceiling windows giving spectacular views in both directions along the river. The dining area seats 10 people and leads to a modern open plan kitchen with breakfast bar. A full length balcony runs along three sides of the apartment. Guests have use of a nearby gym with a small swimming pool. The Penthouse has spacious seating areas with stunning views along the river. It has a 50" plasma TV with Sky HD, Satellite, BOSE sound system and wireless broadband. The Penthouse has spacious seating areas with stunning views of the river. Ideal for relaxing with friends or perhaps a corporate cocktail party. The dining area which seats 10 is ideal for a group of friends or a corporate dinner. We can provide a chef for a special occasion or for the duration of your stay. The dining area which seats 10 is perfect for a group of friends or a corporate dinner. A state of the art Poggenpohl kitchen, complete with American fridge, ceramic hob, microwave, TV and breakfast bar turns this suite into a home from home. A sunny open plan kitchen with breakfast bar. On the top floor there’s a small laundry room, with washing machine and separate dryer, and three bedrooms, all with en suite bathrooms. The master bedroom, with its King sized bed, has stunning views both of Tower Bridge and Canary Wharf. At the rear there’s a sunny and spacious bedroom, which also has a King sized bed, and looks south across London. The third bedroom has twin beds and a view of Tower Bridge. 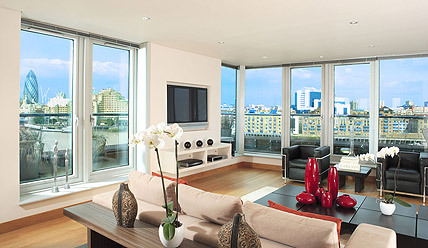 The Master bedroom with King sized bed and en suite bathroom has amazing views of both Tower Bridge and Canary Wharf. A sunny bedroom with King sized bed, en suite bathroom and views across South London. All bathrooms are fully stocked with Aromatherapy Associates products which have no added colour or synthetic preservatives and are enjoyed by Gwyneth Paltrow, Jude Law, Jodie Kidd, Dannii Minogue, Liberty Ross and Sadie Frost. A twin bedded room with en suite bathroom and a view of Tower Bridge.